TOI's Green Drive is entering its final week and is in full swing. On Sunday morning, Raahgiri Day at Connaught Place was used as a platform to mobilize people and make them aware of the importance of tree plantation. 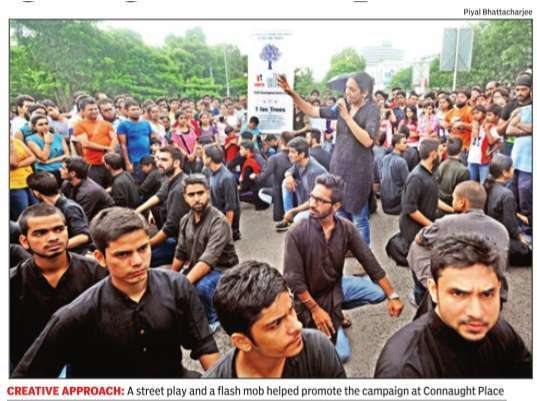 Delhi-based theatre group, Asmita, and Delhi University volunteers from AIESEC, a student-driven organization, helped promote the drive through an interactive street play and a flash mob. Green Drive, a TOI initiative along with Hero MotoCorp and Delhi Development Authority (DDA), aims at planting 1 lakh saplings in Tilpath Valley , Maidan Garhi, on August 30 after covering several areas across the city . The inner circle at Connaught Place wore a colourful look as Raahgiri participants began trickling in at 7am. As they danced to popular Punjabi numbers, a call song by Asmita theatre group attracted their attention, inviting them to watch its street play. The play sought to spread awareness about the importance of tree plantation. It showed how the changing climatic conditions and the increase in frequency of natu ral disasters like floods and earthquakes are a direct consequence of the increase in deforestation. The play sounded an alarm on how razing the existing tree cover for development for one generation would have a negative impact on the future ones. “It is a very good initiative. If people take it seriously, we can prevent our natural resources from depleting.What happened in Nepal and parts of Uttarakhand and Odisha should not happen in Delhi. The rate at which we are cutting down trees in the city exposes us to grave disasters,“ said Shilpi Marwaha from Asmita theatre group. The play received an over whelming response as the artistes interacted with people by raising questions. “We have been performing this play for the past one month. People have understood that there is a need for tree plantation,“ said Marwaha. Members of AIESEC (International Association of Students in Economic and Commercial Sciences), too, promoted the Green Drive through a flash mob. The students made it a fun session for the onlookers by asking them to match steps with them. The organization will conduct walks and flash mobs in different parts of the city to spread awareness. “We reach out to people through Facebook, emails and posters. The kind of future that we are looking for can only take shape if we plant trees,“ Mihir Datta, vice-president, marketing at AIESEC, said. 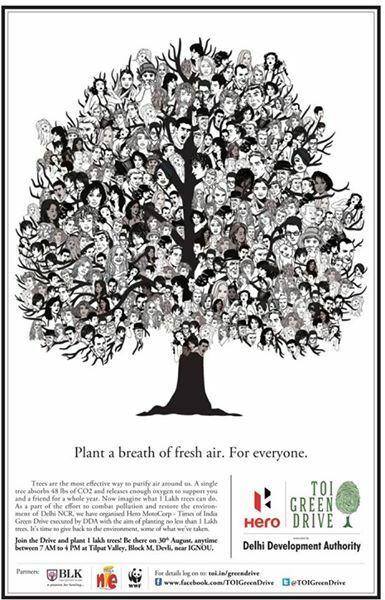 The Raahgiri participants joined TOI in pledging to plant trees by shouting “Green Drive“ in unison. “We are conscious about our fitness but we forget that we need clean air to breathe.Without these, no matter how much we jog or cycle, we won't be able to stay healthy . We need a healthy today and a healthier tomorrow,“ Jai Singh, a cyclist at Raahgiri, said. The Green Drive has made attempts to reach out to schoolchildren, college students and corporates.